Today we had an early start. Mainly because my cousin Lexi and I were having an early-morning conversation - I was in my bedroom downstairs, and she was in her bedroom upstairs. But it was easy enough to talk to each other, we just barked really loudly! So we all went for a nice early walk along the river. I love palm trees at dawn! We met lots of other puppies. Here's my new friend, Bobby. 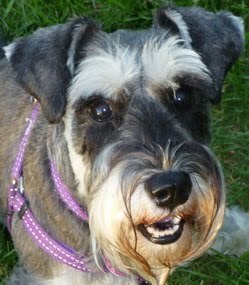 When Bobby arrived, there were four Schnauzers walking together, so we were all in charge! 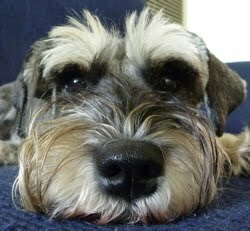 Unfortunately, when there are that many Schnauzers together, we mill around like short, furry, unstripey zebras, and cameras can't focus properly, so we don't have any pictures of us all together. It's just as well, really, as the collective beauty and handsomeness might break the internet. My cousin Lexi and I are becoming good friends. This morning we were sharing toys. I would go pick a toy from the pile, then she would rush up and take it away from me, and add it to her own pile of toys. And whenever my human went to pat me, Lexi would make sure she was there to get pats too. Actually, Lexi reminds me a lot of my cousin Oliver, in Melbourne. She's also a bit of a camera hog. In some ways she's more like Oliver than Oliver is. She's also very elegant and sophisticated, just like my friend Honey. I know Lexi and I are going to become great friends! My goodness, Sasha, that really was a MAMMOTH drive!! My human is totally in awe of your human because Hsin-Yi is quite a "chicken driver" and doesn't like to drive even across to the other side of town by herself, never mind halfway across the country!! Your cousins look really cute and I'm glad you're having a great time with them. And those pictures of your walks are gorgeous! 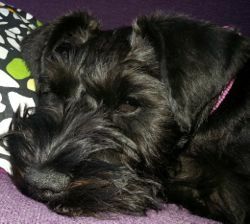 Glad you're getting on with Lexi - loved that you were having midnight chats, he he he! 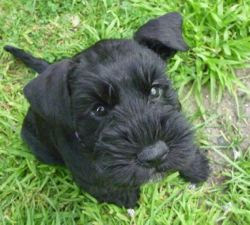 We loved seeing so many photos of so many schnauzers - well, we ARE a gorgeous breed after all! Having just read Honey's comment above - awww, what a shame you girls won't get to meet but Honey obviously has to look after her back. Well, at least it's a GREAT reason for another great adventure for you, when Honey's all better! 4 schnauzer in one place! I can't believe the world didn't explode from all of the awesomeness.